Roaring Brook Press, 9781626729087, 40pp. 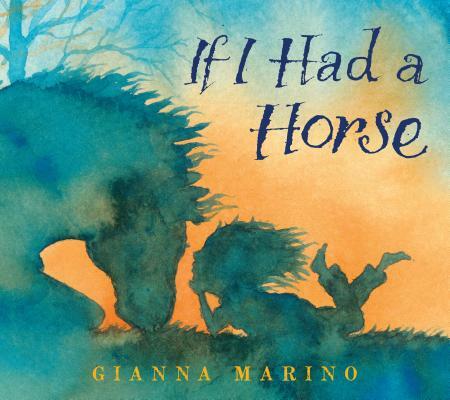 If I Had a Horse is an inspiring picture book with simple text and gorgeous, impressionistic artwork from acclaimed author-illustrator Gianna Marino about a girl imagining what life would be like with a horse. Gianna Marino has written and illustrated numerous articles for travel and leisure magazines. Her children's books include Zoopa: An Animal Alphabet (Chronicle Books 2005), One Too Many (Chronicle Books 2010), Meet Me at the Moon (Viking 2012), Too Tall Houses (Viking 2012), and Following Papa's Song (Viking 2014). Though she still wanders the world, Gianna now lives in Northern California and works full-time writing and illustrating. A Boy, A Ball, and a Dog is Gianna's first picture book for Roaring Brook Press.